Painting skies successfully in oil or watercolour is tricky. Not many artists can capture successfully the range of colour, grandeur and rapidly changing nature of Yorkshire skies, which, as you would expect a Yorkshireman to say, are the grandest of them all. And, thus, only a Yorkshire artist could do justice to them. But here are four Yorkshire artists – two now dead, and two very much alive – who have done it. He was “The finest sky painter of our day.” So said Sir Frank Brangwyn of the Yorkshire artist, Bertram Priestman – no mean compliment, coming from Brangwyn, one of the finest British painters of the 20th century. Bertram Priestman was born 1868 into a Bradford Quaker family. He was one of seven children, and his father, a local businessman and enthusiastic art collector, filled his home with fine paintings. When he left school Bertram began to study engineering at the local technical college, but quickly grew bored and abandoned this idea to study art at the Slade School of Fine Art in London. There his talent was quickly recognised. Bertram’s mature work combines the influence of French impressionism with his own atmospheric interpretation of the English landscape, characterised by its bright and luminous colours. His work was inspired by the power of nature, and its scale, power and grandeur is often represented in his work. In the painting here: ‘His Majesty’s Mail, Kilnsey Crag’, the coach, horses and humans are dwarfed by the scale of the Yorkshire Dales, near Grassington. But in turn, the landscape is tamed by the huge skies above it. Thus a perspective is introduced, both artistically and symbolically, and the transitory nature of Man’s affairs, as represented by the mail coach, are seen to be eclipsed by the natural world. Look at the sky in Priestman’s painting. Look at how the sun breaks through, and how the artist captures the gradations of colour in the clouds. 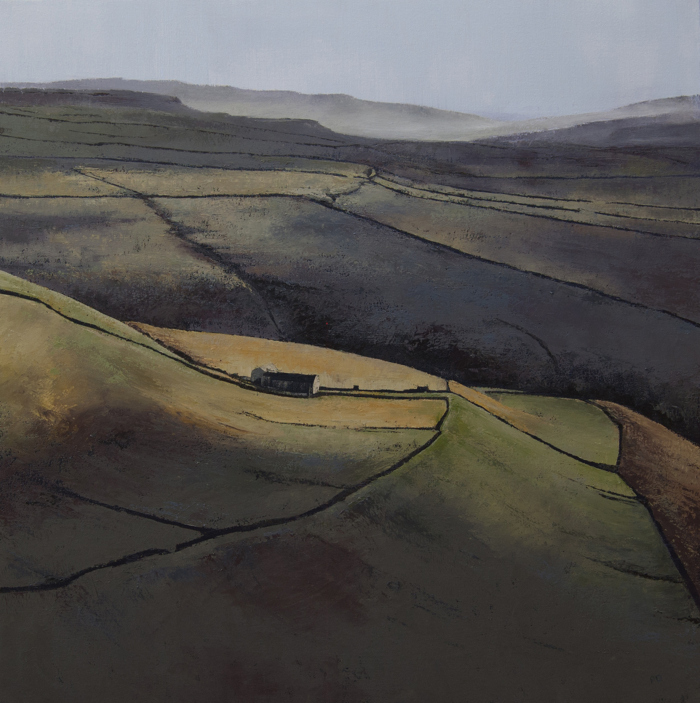 This is one of my favourite paintings of the Yorkshire landscape. The inimitable Joe Pighills was born in 1902 and lived all his life in a terraced cottage on the edge of Haworth Moor. He was from a working class agricultural background and left school at 14 to work as an apprentice pattern maker. But he always loved to draw and sketch, and when he retired at 63 he began to paint the local countryside around his home, soon building a reputation for his sensitive work. Today his paintings are in many private collections, as well art galleries in the north of England. He died in 1984. Joe’s talent was to catch the rapidly changing sky moods high on the Haworth moors. 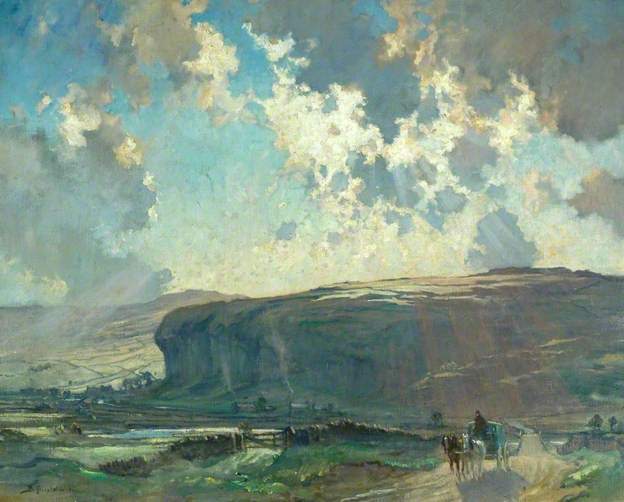 In his painting ‘Far Westfield, Haworth’, shown here, he catches the wind blowing the clouds toward the left of the painting. This sense of movement is reinforced by the wind-blown shape of the low tree, centre, and left leaning stones on the wall in the left foreground. As with Bertram Priestman, Joe layers a range of related colours, particularly green, and catches the sense of rainclouds advancing quickly from right to left in the painting. Lucia’s work catches this sense of how the light from the sky impacts on the earth, shifting and changing the colours on the land. In the work we see here, the mixed cloud patterns reflected in the land below, with a break in the cloud highlighting a section of earth in the foreground, left of centre. Notice how Lucia emphasizes the purple of the heather by contrasting it with the foil of a generally dull sky. 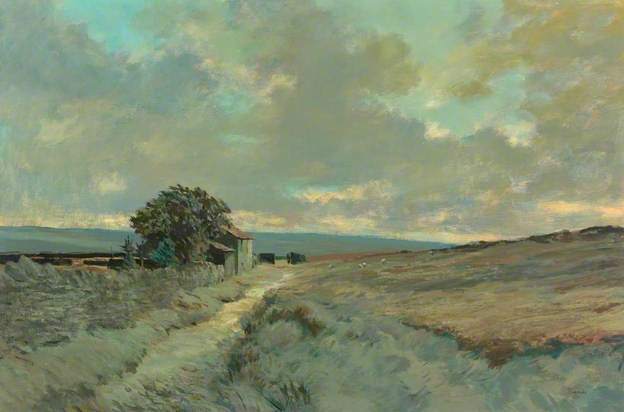 In the work shown here, ‘God’s Own’, although the land dominates the painting there is a strong omnipresent sense of the sky impacting on the scene. Look at the way the light from the sky is reflected on the land and how it changes the colour tones. The farm in the centre of the work is dwarfed by nature and highlighted by the sunlight falling on it. Note how our eye travels along the line of the wall from the lower left upwards, curving to the left, taking our line of sight to the building. These Yorkshire artists – and many more like them from the Bradford district of west Yorkshire – can be found on my website.